Relentless, intense and a struggle at times. The themes of Sheffield Wednesday’s defeat to Leeds United were surely reflective of the challenges of Steve Bruce’s managerial career as he marked 900 matches in the dugout, some 20 years on from his first gig with the other team in Sheffield. And Wednesday, playing in the knowledge that a win would help both their own play-off hopes and their most bitter rivals’ automatic promotion ambitions, suffered at the hands of those three features in an unremitting performance from Marcelo Bielsa’s team. From the off the Whites were the sharper side, seemingly with extra bodies on the field as they were so often first to the ball. That remained the case until the final whistle as the home side ended a month-long wait for successive league victories to inflict Wednesday’s second defeat in a week thanks to Jack Harrison’s winner. Ahead of kick off, the Owls were boosted by the returning central midfield duo of Barry Bannan and Sam Hutchinson who overcame injury and illness respectively as Gary Hooper was a third change to the starting side from Tuesday night’s win over Nottingham Forest. A late amendment to the Leeds line-up saw Gaetano Berardi come in for Liam Cooper who was injured in the warm up as Luke Ayling took the captain's armband. But in spite of the pre-match disruption, Bielsa’s men were unflappable in the cauldron of noise at Elland Road. Leeds were quick out of the blocks and remained at a canter over the course of the ensuing 90 minutes despite the Owls’ best attempts to prevent their opponents from securing three points. 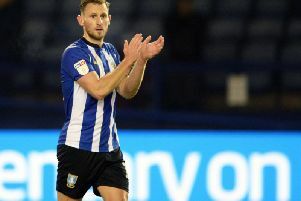 Captain Tom Lees, who marked his own career milestone of 200 outings for Wednesday on Tuesday night, was the star outfield player against his former club. The sides shared exchanges early in the match, but Keiren Westwood was by far the busier of the two ‘keepers as he watched a flurry of action in front of goal before being called into action from a Leeds corner. In what will surely make the ‘saves of the season’ highlight reel, the Wednesday man pulled off a spectacular stop from point blank range as he tipped Tyler Roberts’ header over the bar from an Ezgjan Alioski cross. It wasn’t long before Wednesday were up the other end with what would prove to be their best chance of the game, as Steven Fletcher played Gary Hooper in on goal with a cute touch. The Owls striker did well to round Casilla but could only find the side netting from a tight angle. More half chances came and went for Wednesday as the ever-industrious Fletcher collided with Casilla outside the box, before Reach scuffed one in a crowded penalty area. The wide man was then forced off with an achilles injury, in a cruel blow for Wednesday as Steve Bruce called on Tuesday’s two-goal hero Marco Matias from the bench. Those few chances at goal were enough to set off alarm bells for the Whites though, as they moved into fifth gear with 25 minutes on the clock. “They don’t do anything against you that any other team doesn’t do but they do it with an intensity and a quickness,” said Bruce. And how right he was. It was Westwood’s time to shine – and prove yet again why he should be offered a new contract –as he was forced into a big stop from Hernandez who headed goalward from Ayling’s inch-perfect cross. Then came another golden opportunity for the hosts as Hooper cleared off the line from Alioski’s driven shot after a bit of corner induced pinball around the box. And so the onslaught continued until half time as chances for Jansson and Roberts came and went. After the restart it became clear it would only be a matter of time before Leeds scored as Wednesday were camped in their own half and defending for their lives. Both Michael Hector and Morgan Fox were forced to clear in emphatic fashion as the pressure mounted and knocking it long for Fletcher to hold up seemed the only option. Finally Wednesday were unable to keep Leeds at bay any longer as Bamford fired a warning shot that trickled across Westwood’s goalmouth and then Harrison sidefooted past the Owls ‘keeper to break the deadlock on 65 minutes. Having tasted blood Leeds continued to rush forward in a tide of white shirts, finding their way through gaps that Wednesday could only stick a plaster over in the hope it held long enough for the sweet mercy of full time. United’s Kemar Roofe, returning from a two month injury absence, did manage to put the ball in the net for a second but it was ruled offside. Wednesday didn’t go out with a wimper as Bannan’s deep cross allowed first Fernando Forestieri, then Marco Matias to unleash fierce shots but both were deflected as time ran out for any hope of a comeback.